HONOLULU – George D. Szigeti, president and CEO of the Hawaii Tourism Authority (HTA), issued the following statement regarding today’s news that a four-year extension has been reached with the PGA TOUR to continue supporting three championship golf tournaments in the Hawaiian Islands. “When the New Year begins, the world of golf turns its attention to the beautiful Hawaiian Islands for championship tournaments in an unmatched setting. I am proud to say that Hawaii will continue to own this honor in professional golf for the next four years through 2022, with the renewal of HTA’s official marketing partnership with the PGA TOUR. “Each January, sports fans everywhere can count on Hawaii being the picturesque backdrop over three consecutive weeks for the Sentry Tournament of Champions on Maui, Sony Open in Hawaii on Oahu, and Mitsubishi Electric Championship at Hualalai on the island of Hawaii. “As regions throughout the country cope with winter’s icy chill each January, we will continue to celebrate the greatness of golf in Hawaii on some of the game’s most spectacular courses surrounded by some of the world’s most magnificent backdrops. Hour after hour of TV coverage provided by the Golf Channel will present an enticing incentive for viewers to plan a trip to their favorite island. “We are very grateful to PGA TOUR Commissioner Jay Monahan and his entire team for being such a wonderful and supportive partner to the State of Hawaii. This new four-year agreement is a direct result of the PGA TOUR’s faith in the Hawaiian Islands as a world-class destination for golf. “Renewing this agreement on behalf of the Hawaiian Islands involved many people, but none bigger than John Monahan, the president and CEO of the Hawaii Visitors and Convention Bureau. John led the charge in getting this deal done with the PGA TOUR, and has earned the gratitude of Hawaii’s tourism industry for his dedication to showcasing our beautiful islands. “Hawaii’s ultimate ambassador of golf, Mark Rolfing, deserves enormous credit for the PGA TOUR having such a strong presence in Hawaii. Mark is a respected voice in the global golfing industry whose opinion about the quality of Hawaii golf resonates with PGA TOUR officials. “The renewal of this official marketing partnership with the PGA TOUR exemplifies HTA’s sports marketing strategy to collaborate with major sports brands that bolster tourism – the state’s leading industry and provider of jobs – and are in keeping with Hawaii’s revered image. 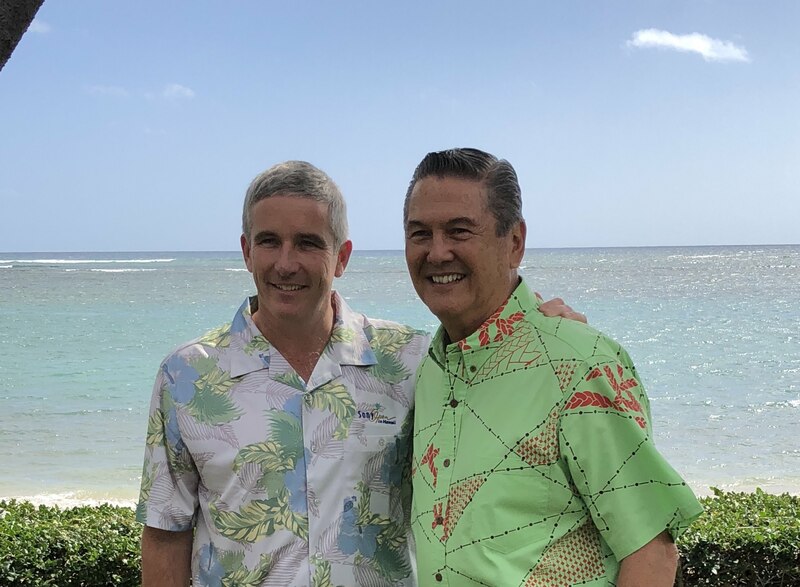 Image caption: (l-r) Jay Monahan, PGA TOUR Commissioner, with George D. Szigeti, President and CEO of the Hawaii Tourism Authority.